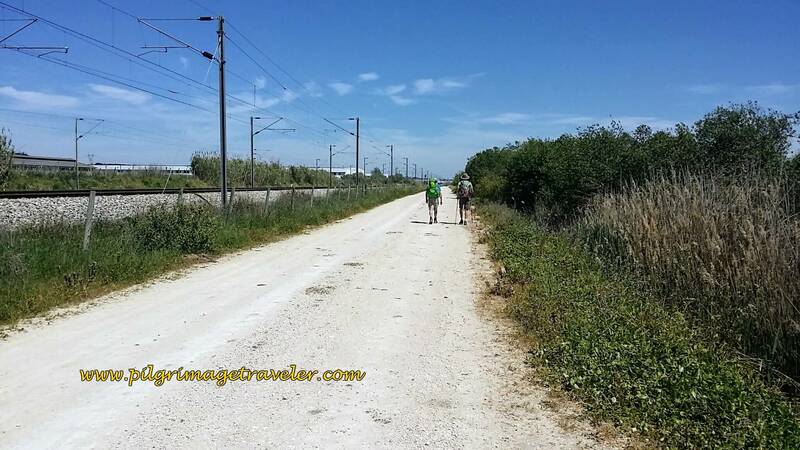 Our Day Two on the Camino Portugués was initially interesting, then quickly turned hot, dry, and long. If I said day one wasn't industrial, while true, the second half of day two made up for it. 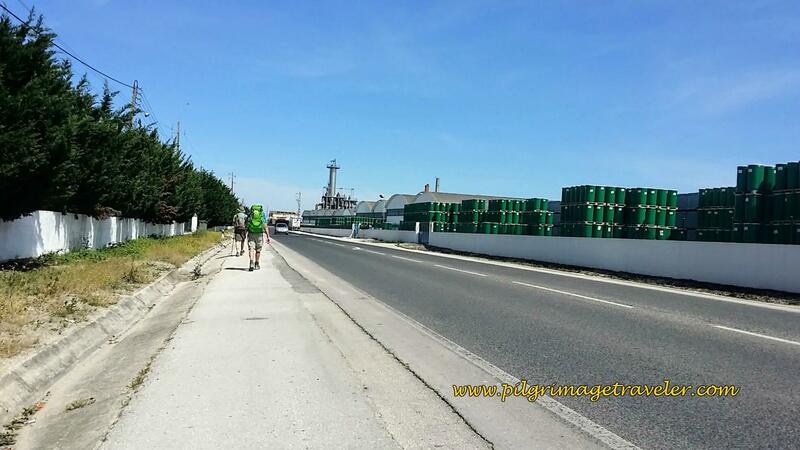 This was perhaps the most boring leg of the Camino Portugués. Despite the slog, we were treated like true guests of Portugal, the Portuguese being the most friendly of people! 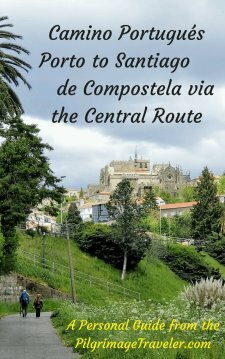 I added the route, in light blue that we took to rejoin the Camino (Point B), from the Alfa 10 hotel (Point A). If you include this route in your mileage for the day, you will need to add 1.5 km, for a total of 31.24 km for the day. Here are my elevations stats from day two on the Camino Portugués. As you can see, it is almost totally flat! Essentially, a long, easy day. I am also giving you a link of the same map, above, if you care to see the route with our photos included. Click here to see this map. After our grueling day one, I woke up on day two, feeling surprisingly well. Fortunately, I had slept well and was free of any aches, pains or blisters. It was a fresh and dewy morning as we met our Swiss friend and set off at 7:00 a.m. We had 1.5 km from the Alfa 10, to get back to the Camino. We used our little printed map from our hosts to guide us. Luckily, there was a gas station along the route, right next to the Jumbo grocery store that was open! (see map) In Portugal, 7:00 a.m. is very early, and very few cafés are open before 8:00 or 9:00 o'clock. 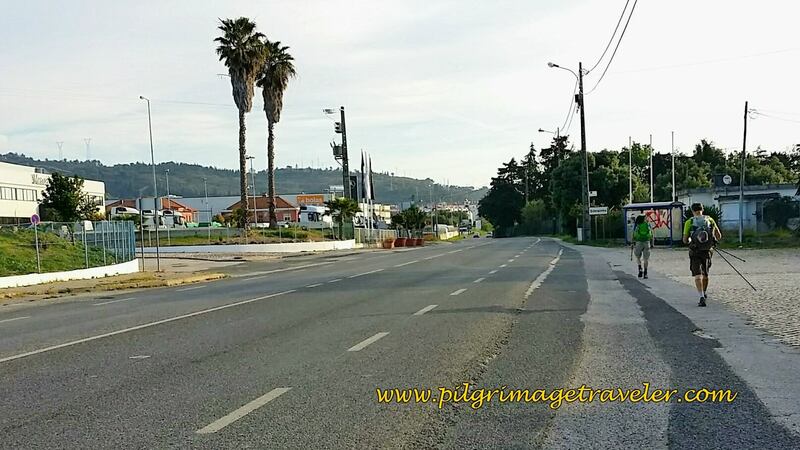 When we joined the Camino on the Avenida Infante Dom Pedro, the way immediately veers to the left on the Rua 20 de Maio 1449. The Way, then takes a turn to the right, shown in the photo below. After turning right onto the Rua Catarin Eufémia, up ahead it looks like the road ends into a dead end at the field. (It was a cornfield for us, but I imagine this could change.) Instead, you see this sign below, and turn left onto a path by the building fence, below. 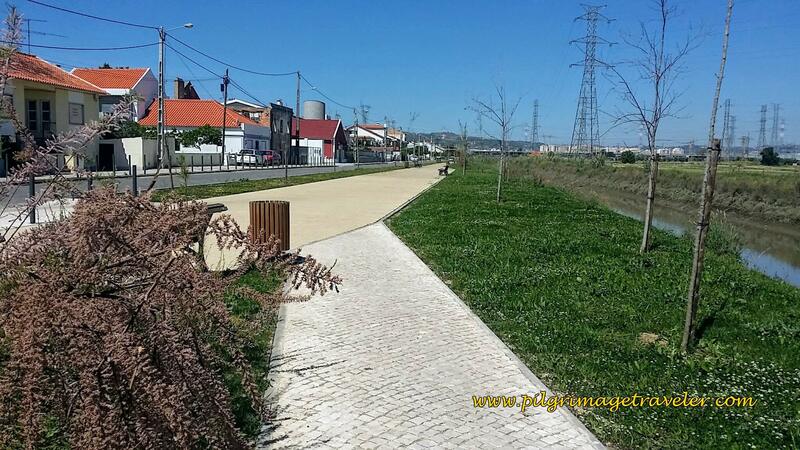 The path soon leaves the building and crosses a long field, leaving Alverca. It was a gorgeous path in the early morning light. The path soons rejoins the pavement, and walks briefly through some warehouse areas, before joining the busy N10, below. 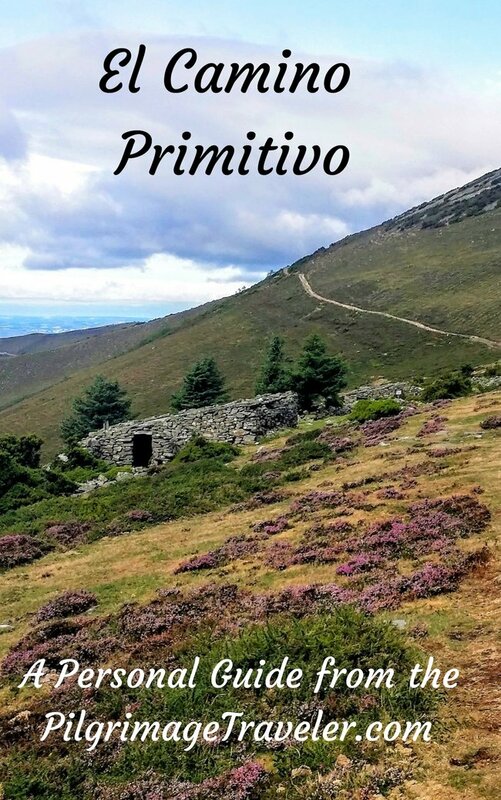 The Camino is not very lovely here as it follows the N10 for a good 1.5 kilometers, walking through Sobralinho on the way to Alhandra. As the road bends and the shoulders changed, to be safe on this road, we found ourselves choosing to cross from right to left to find the safest passage. 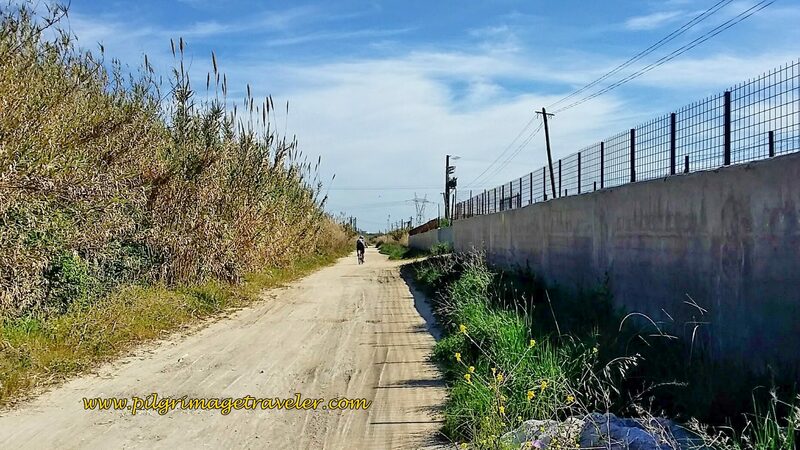 Today being Sunday, there were many bicyclists using this route as well. 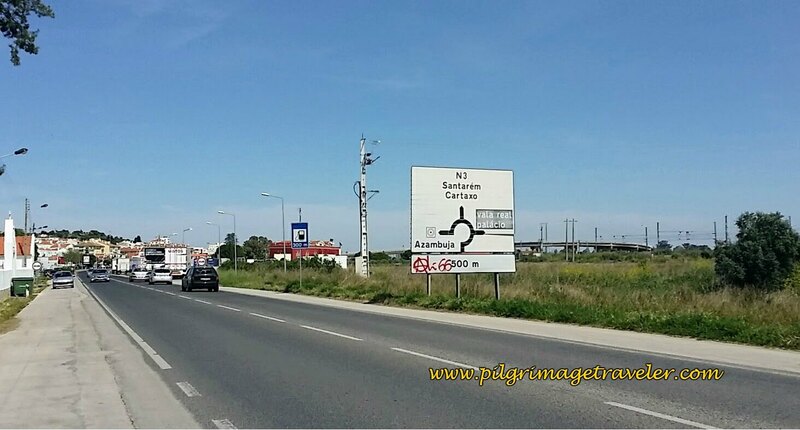 When you see the sign for Alhandra, after about 5 km into day two on the Camino Portugués, you know this stretch on the N10 is almost over. 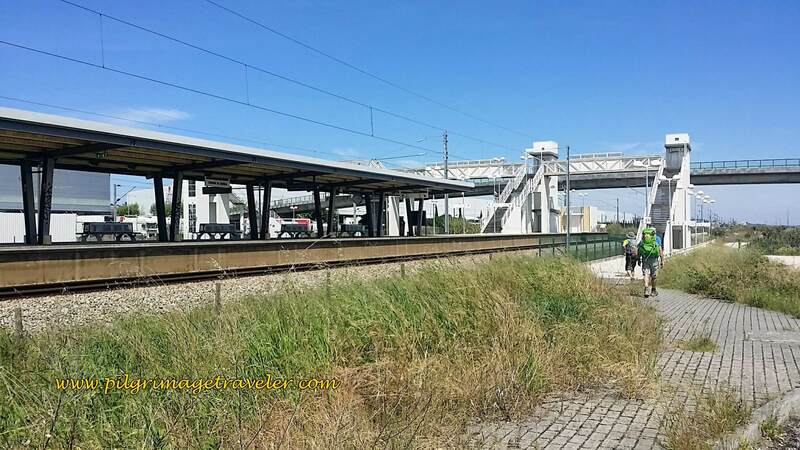 After entering Alhandra, you can see the train station to your right as the N10 climbs left to the overpass. 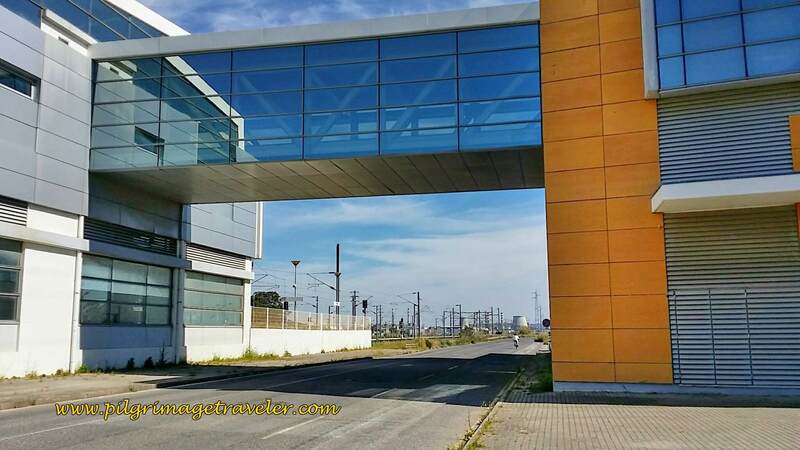 Next, you turn right, onto the overpass and get a bird's eye view of the train station. Onwards we went, up and over the bridge and back towards the waterfront. Here is Rich and our Swiss friend, joining the Passeio Pedronal Ribeirinho de Alhandra, or essentially translated, the Alhandra Riverwalk. The Portuguese are very friendly, when you engage them. As several bicyclists passed us on the riverwalk, one calls out to us, "Good Morning!" I returned the salutation with with "Bom dia," and I got a hearty a thumbs up in return! 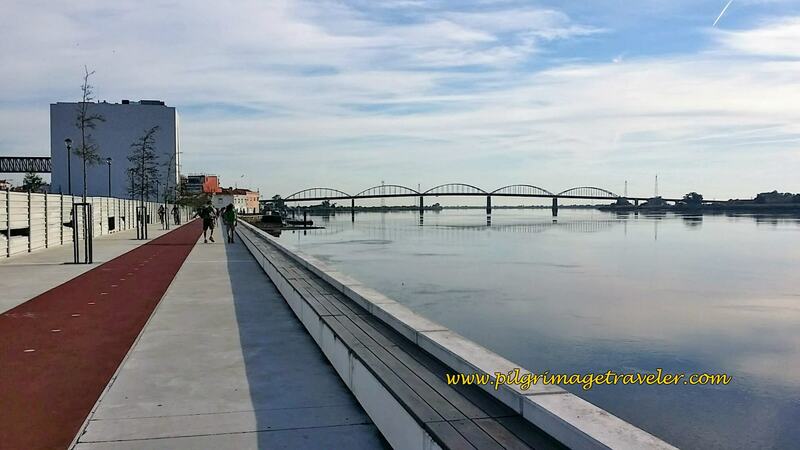 The Riverwalk continues for about a kilometer as it passes through town. 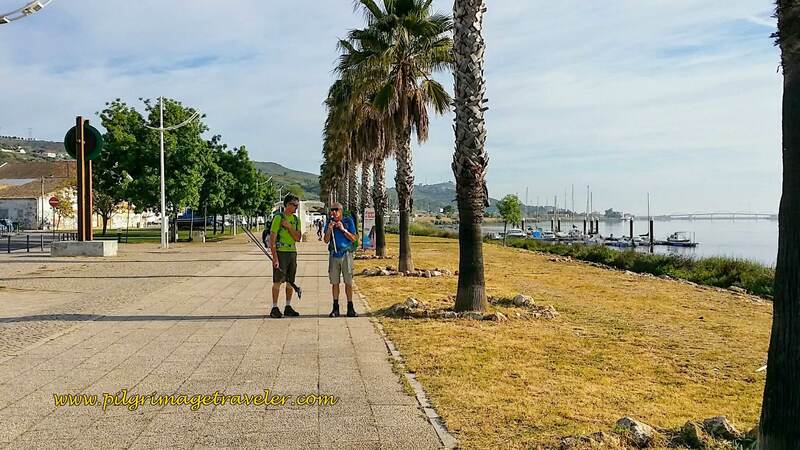 Here is Rich and our Swiss friend pausing for me, for a photo, as the marina comes into view. If the timing is right, and you are carrying your own lunch, there are lovely shady respites for lunch along the Alhandra Riverwalk. 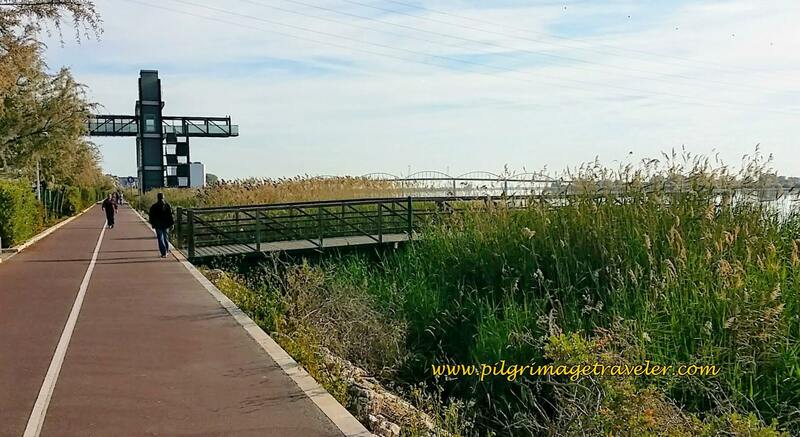 After leaving the town of Alhandra, the Passeio Pedronal Ribeirinho becomes the Caminho Pedronal Ribeirinho. 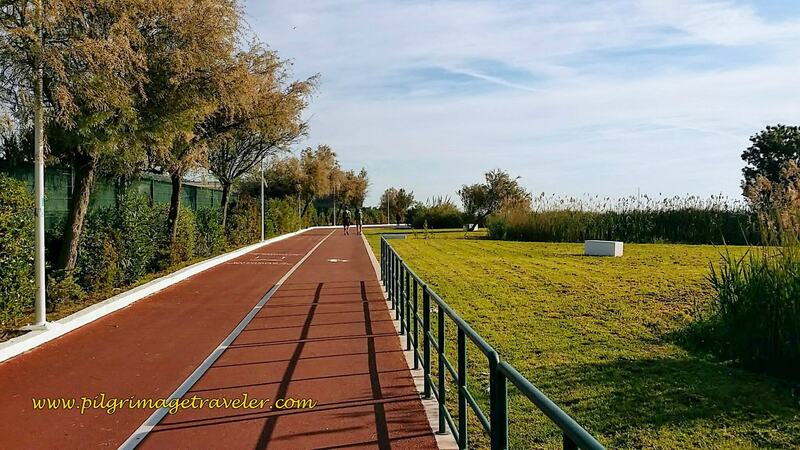 It follows this 2-way track along the Rio Tejo for the next two full kilometers, or so. On the Sunday we walked this walking/jogging track, there were many Portuguese out and about. It is easy to see why, as we walked on this beautifully planned walkway. 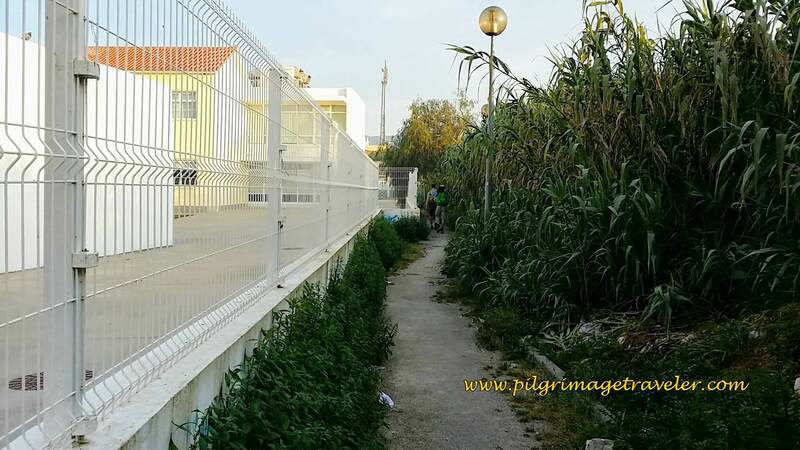 Here is the final stretch on the Caminho Pedronal Ribeirinho as it walks into Vila Franco de Xira. The 2-way track ends at the sculpture, of Álvaro Guerra, a famous author and journalist from Vila Franca de Xira. 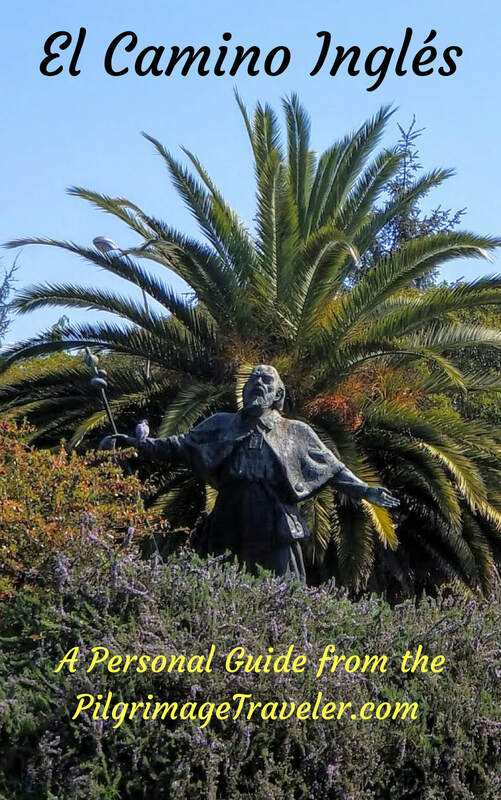 Here is a nice blog from his granddaughter that describes the sculpture and how the town honored his works. 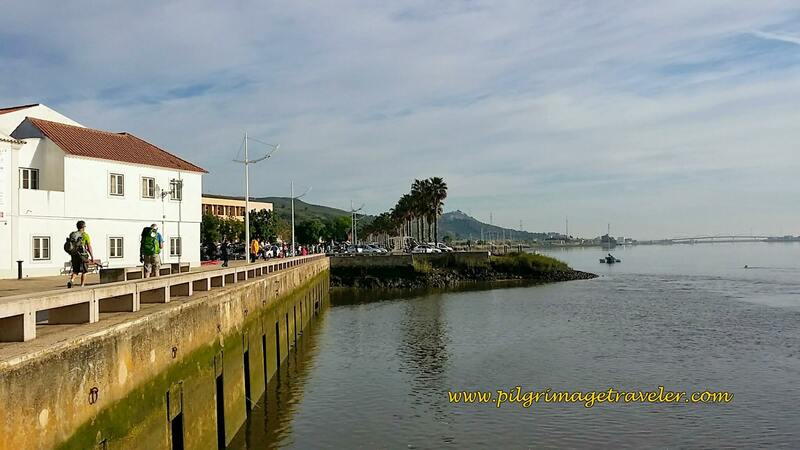 The Camino de Santiago continues past the sculpture and along the waterfront. At about 9.5 km into day two on the Camino Portugués, we decided to go into town to look for a café for a coffee break. 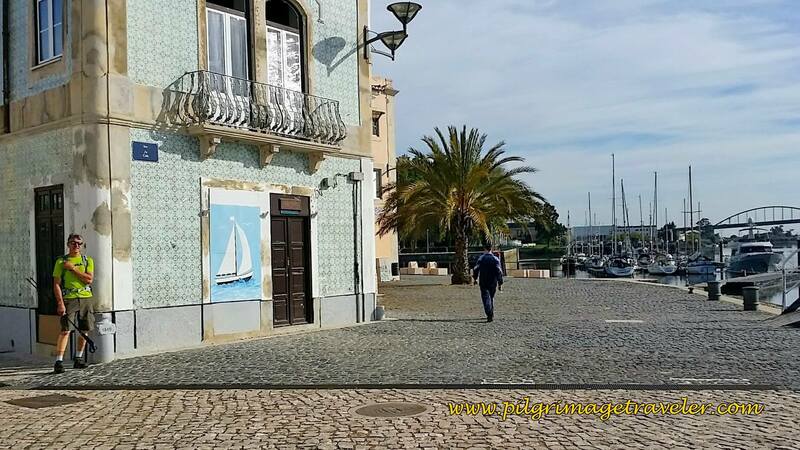 At this lovely tile building by the marina, we turned left into town. The town looks lovely, and we soon found Christina's, a very inviting place. Here are the boys, selecting a table. The pastry selection here is marvelous, and we were soon scarfing down empanadas and more pastel de nata! Christina's Pastelaria ~ Yum Yum! I wish we had more time to explore the town, as it is quite charming. 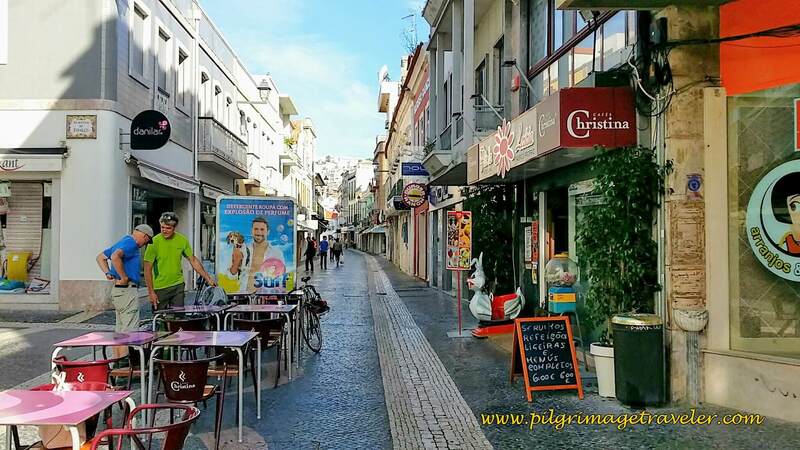 Here is another blog regarding Vila Franca de Xira. Indeed, if you spend the night here, there are sights worth seeing. While taking our break, our Swiss friend, desiring to lighten his load, starting tearing pages out of his guide book that he no longer needed! 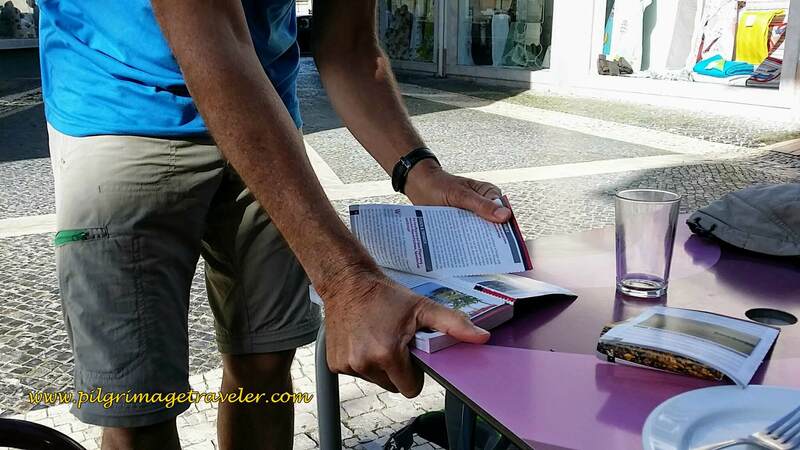 He confessed that he had two books, and he already ditched one back at the hotel in Verdelha. Since it was already hot by the time we stopped for our break at 9:00 a.m. it was imperative that he lighten his pack. If the afternoon would be anything like day one, it was going to be a very hot one. Rich picked up our friend's pack, and then I did. OMG, it was about twice as heavy as Rich's. 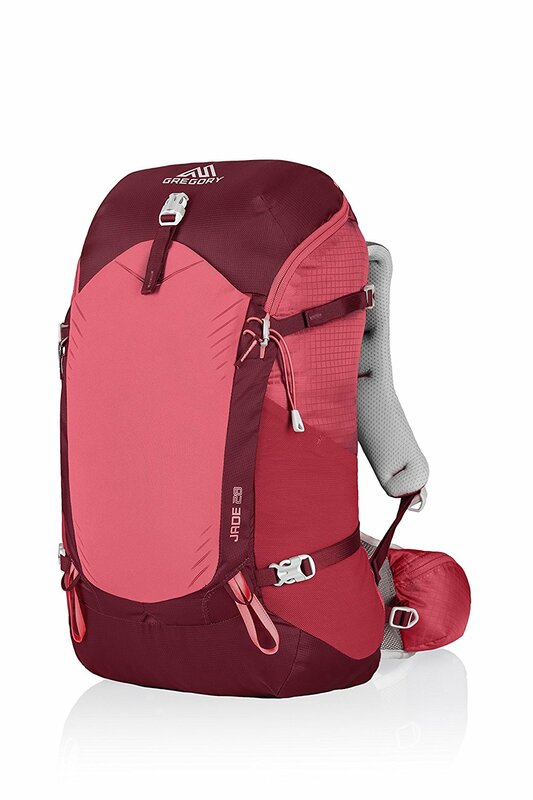 When we commented on how heavy the pack was, our Swiss friend only replied, that this was a "normal" weight. 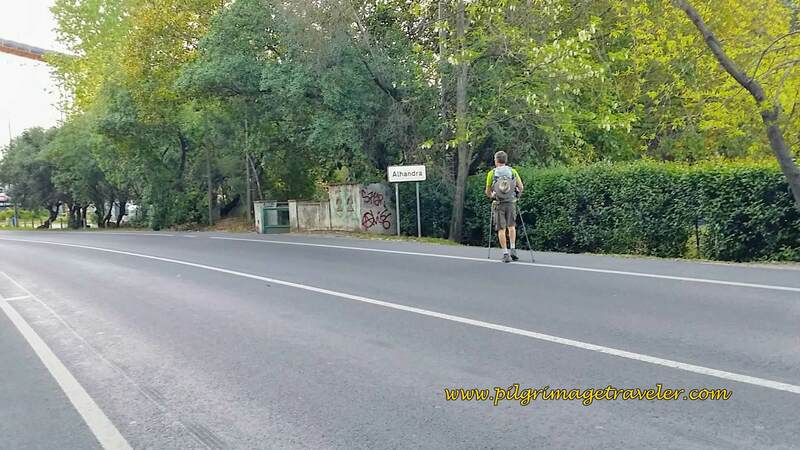 Obviously this was his first Camino! We chuckled and stated, that yes, his weight might be normal for a backpack in the Swiss Alps for a few days, but way too heavy for a pilgrimage traveler! He didn't say a word in return. Each to his own! 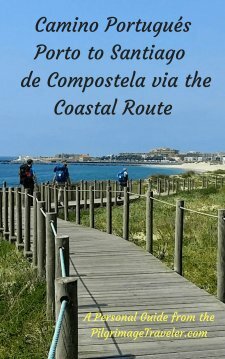 After lightening his pack by a few pages, and adding much more weight into our stomachs, we rejoined the Camino at the docks. We discovered a small Christina's right along the waterfront promenade! We would not have had to turn into town, but we had not walked far, so we had no regrets. 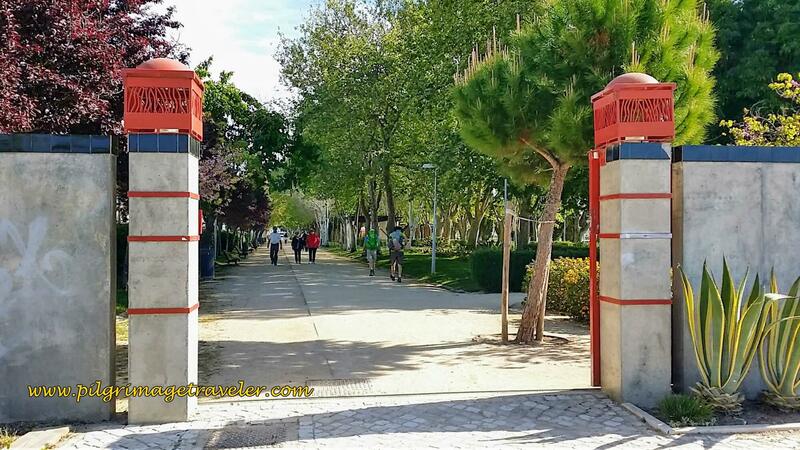 Very shortly, we entered this park, the Park Jardim Municipal Constantino Palha. 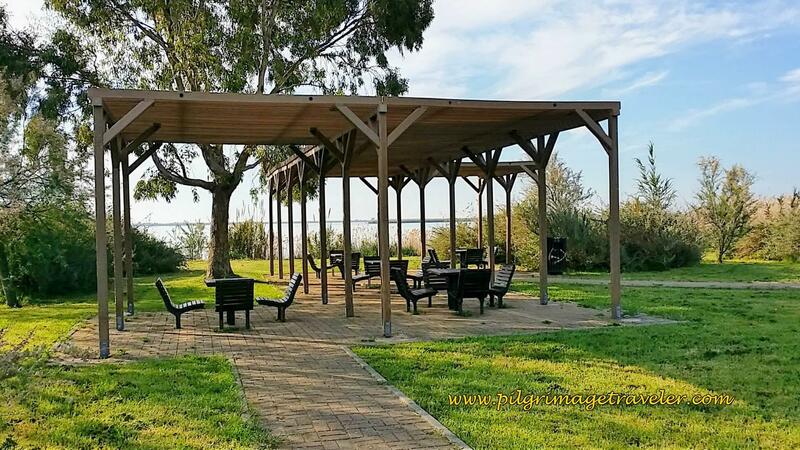 Another place for a wonderful break, if you were carrying a picnic. This park is such an amazing and lovely retreat from the hot Portuguese sun. 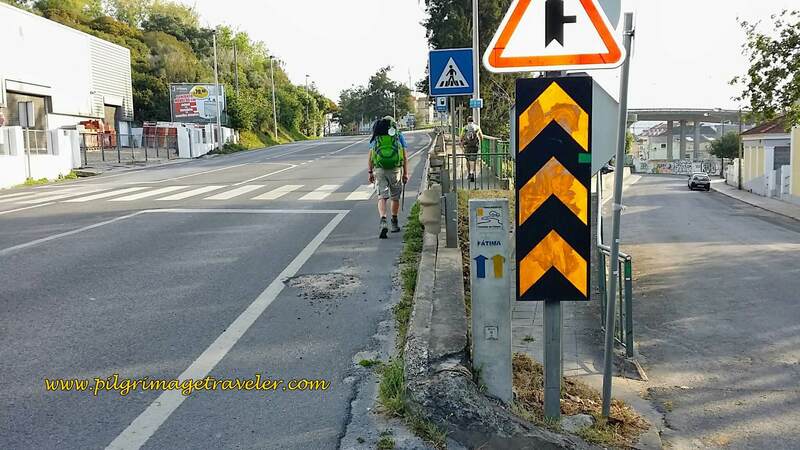 I continued to be amazed on only day two of the Camino Portugués, how hot and dry it already was in Portugal in early April. At least this year (2017)! 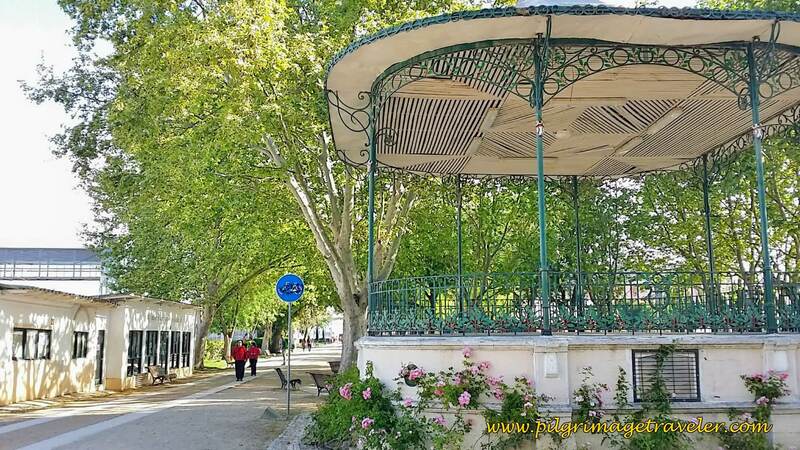 In the middle of the park, the Vila Franca train station is on your left. It is a gorgeous building and I took several pictures of it. 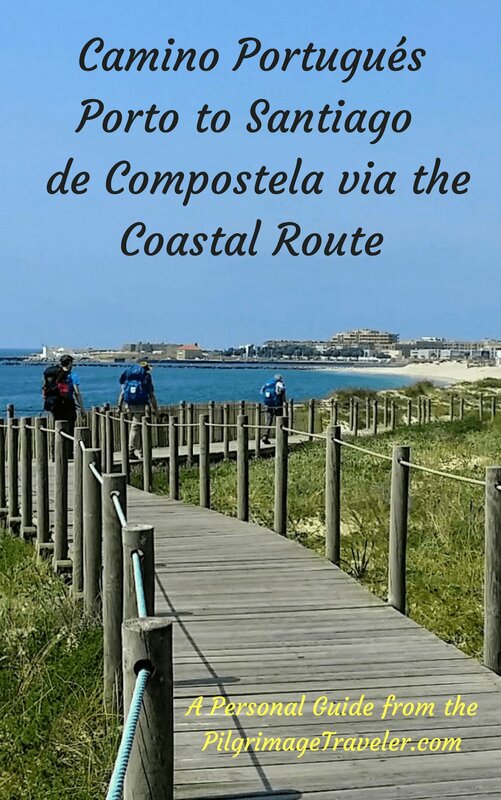 After leaving the cool, shady park of Vila Franca, the real Camino began for me. The road after the park is narrow and quiet, but paved as it walks out of town. Here the surrounding fields are wide open, totally devoid of shade, or any attractive features. I do not have photos of this one kilometer stretch or so. The unnamed road crosses under the N10 and eventually leaves the pavement to turn right at this junction. 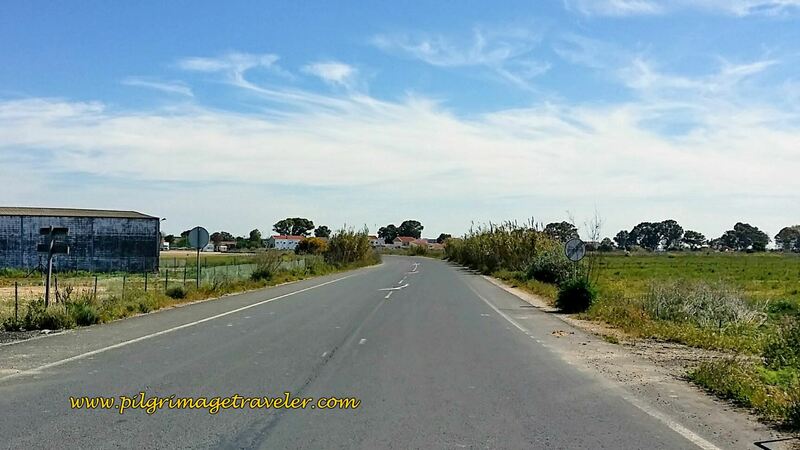 The dirt lane takes you in the direction of the next town, Castanheira do Ribatejo. 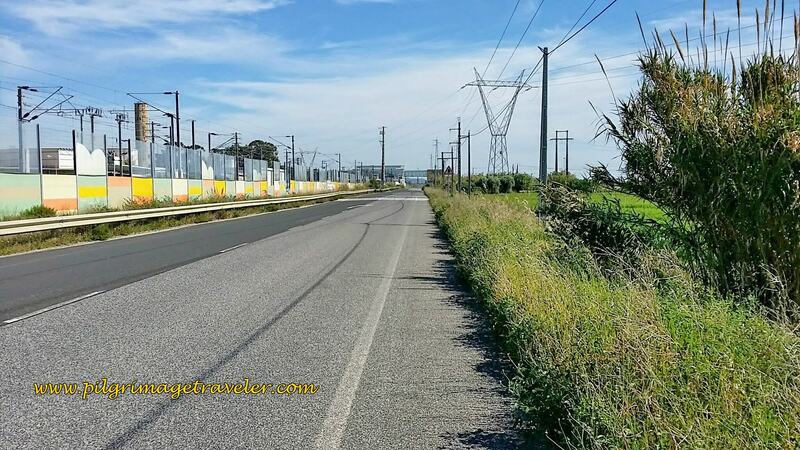 While the photos don't depict it well, the large power plant in Carregado (see below) is within sight, almost the entire way from Vila Franca to Carregado on day two on the Camino Portugués. 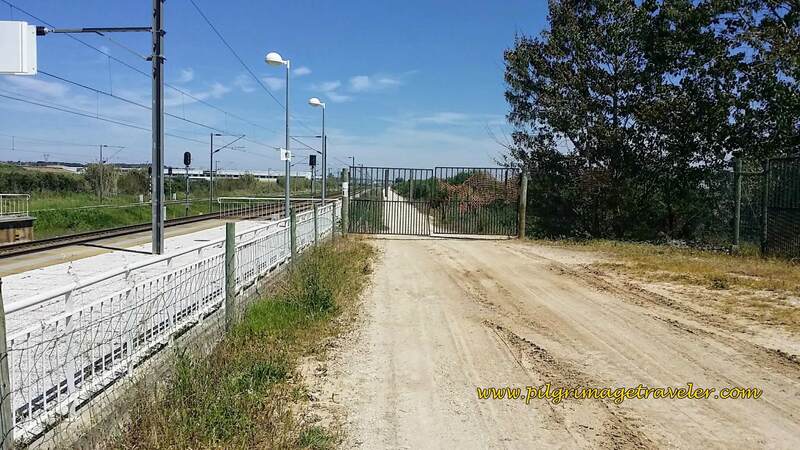 The winding dirt track does not join the pavement until it reaches the Estrada do Apeadeiro, just before the train station in Catanheira do Ribatejo, shown below. The glass building over the street ahead, is the train station. 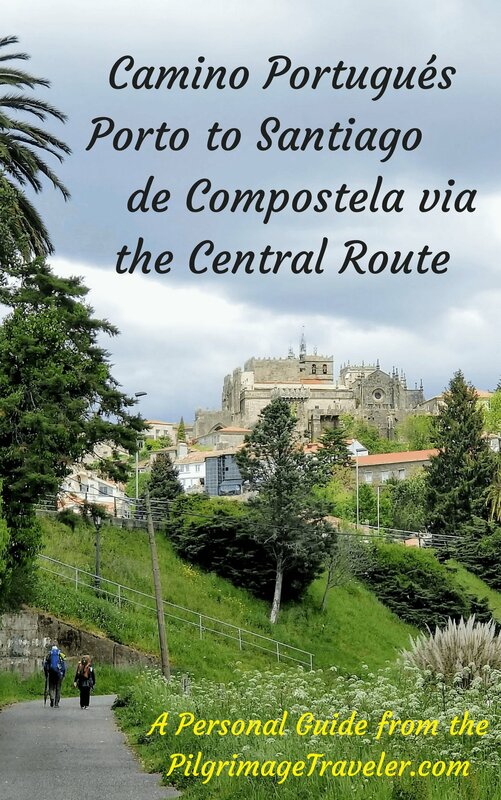 I promised I would show the good, the bad and the ugly on the Portuguese Way and my photos of this section on day two of the Camino Portugués fulfills my promise! 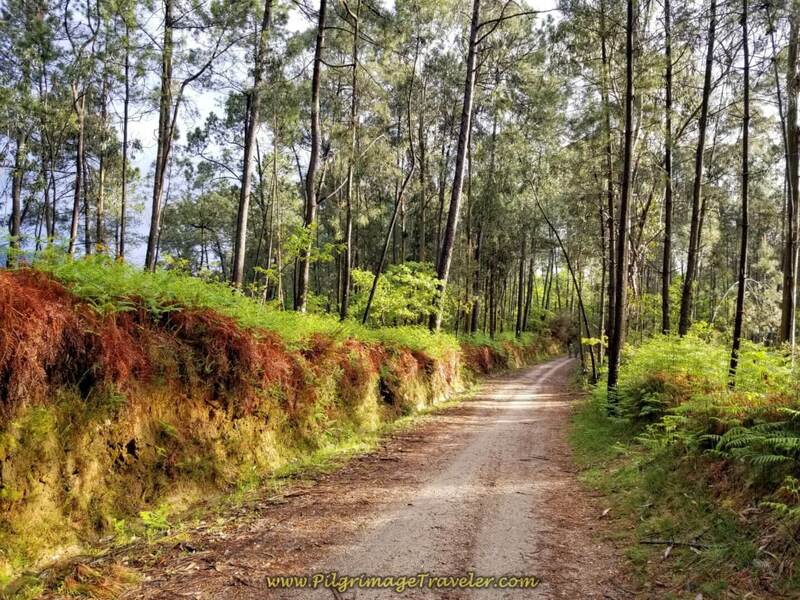 I couldn't decide which part of the Camino from Vila Franco was least desirable, the long, hot dirt lane, or the long, hot paved roads! 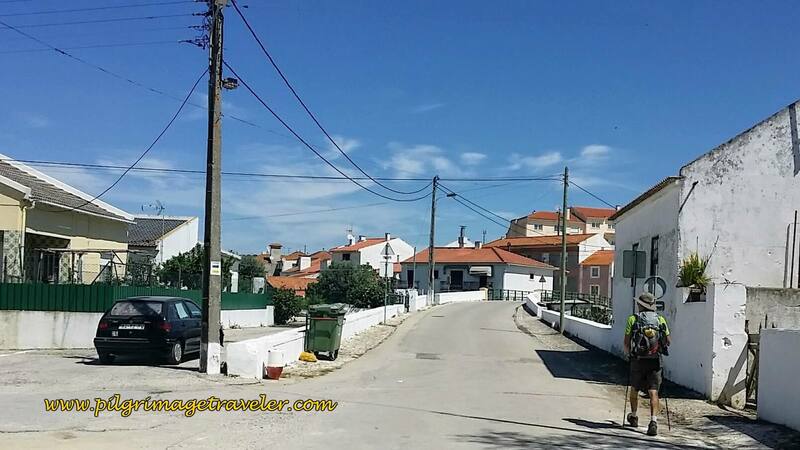 The long, hot pavement continues onwards toward Carregado. This section, was clearly, just putting one foot in front of the other. As you can see in the photo above, there is a shoulder once in a while to get off the hard surface of the pavement. It did help to walk on the shoulder. 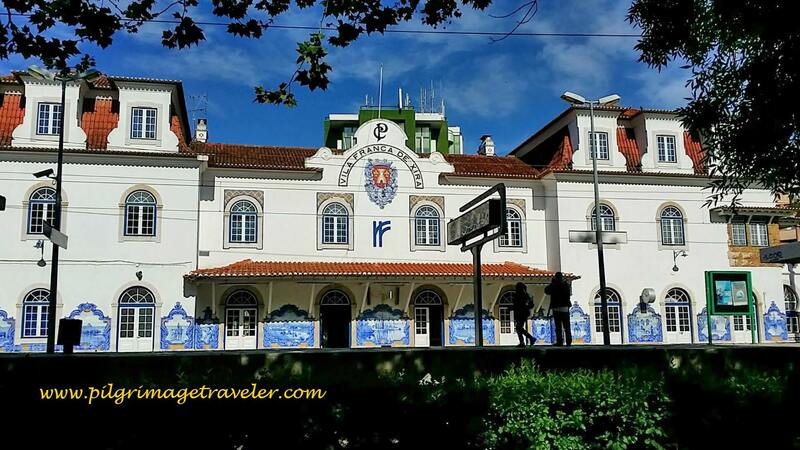 As the above road comes to a T-intersection, the Camino turns left on the Rua Prudêncio Duarte Correira, and ahead is the Carregado train station, finally coming into view. 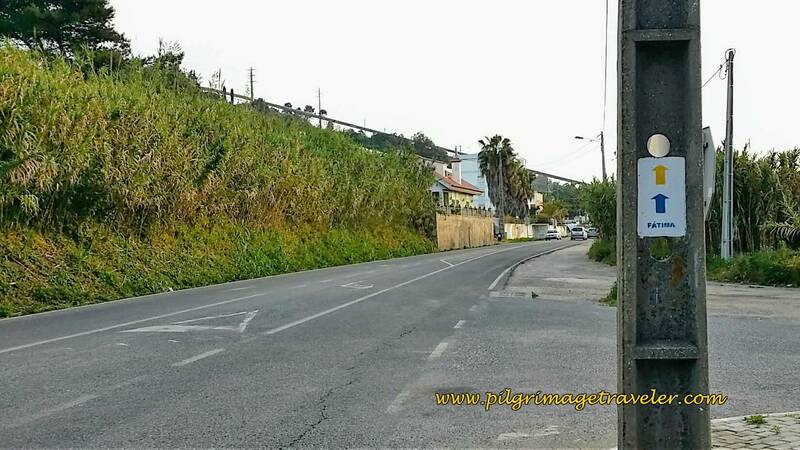 It took us about an hour and a half, to do the approximately 7.5 kilometers on this stretch from Vila Franca to Carregado. It felt like 3 hours! 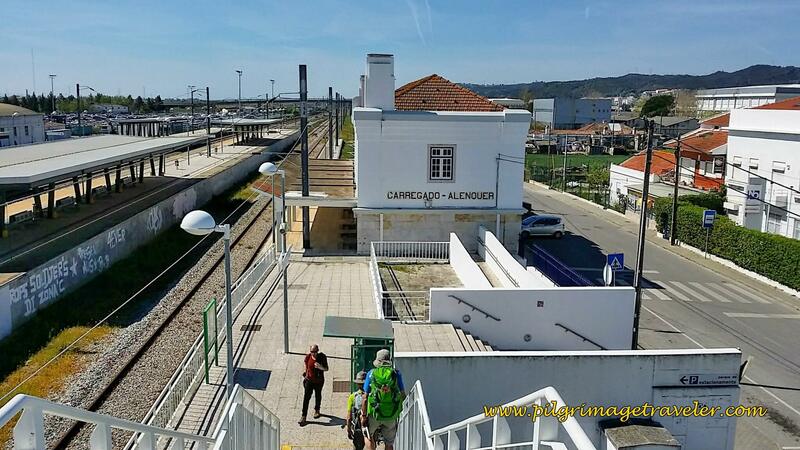 When you reach the station in Carregado, you need to take an elevator or stairs to go up, over and across the tracks, and then walk down the steps on the other side, to the west of the tracks. We chose the elevator up, but took the stairs down on the other side! 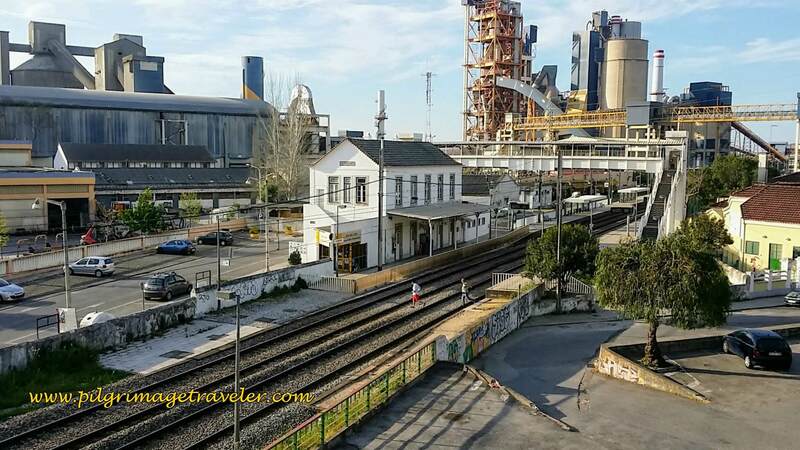 The Way then immediately turns right from the train station, heading northeast on the Rua da Estação towards the Power Plant. 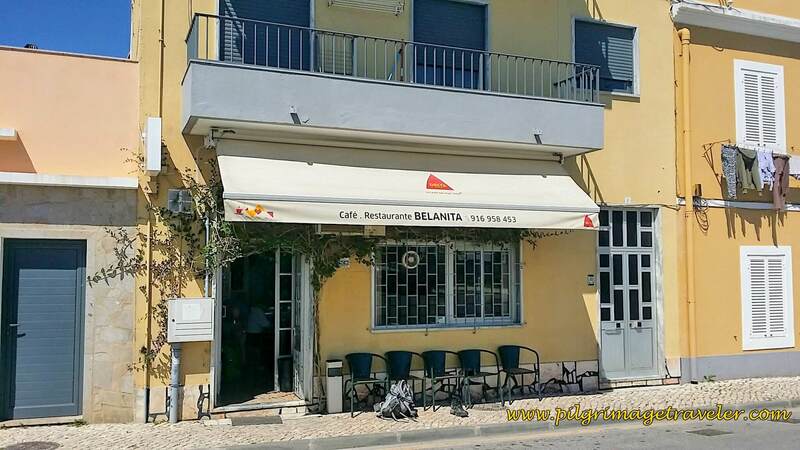 On the next corner, before you have to turn left onto the Estrada da Vala, we ran into this Café and Restaurante Belanita (see map above), in the photo below. It harbored a shady spot to get some respite from the sun. We were ready for another break! All the hot pavement was hurting my feet and I was grateful for a place to stop, rest and air them out! Rich's right little toe was bothering him, and our Swiss friend, still sticking with us, was starting to complain about the heat. 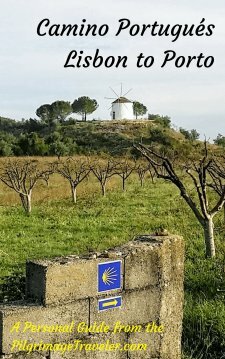 I had read a poetic little blog, where a group of Sisters did a Camino de Santiago together. One nun described her pilgrimage as "praying with her feet." The only problem with that description for me now, was that my feet didn't feel much like they were in prayer! They were hurting too much, as well as my legs. At this point we were not yet 2/3 of the way at about 17 km into our day two. 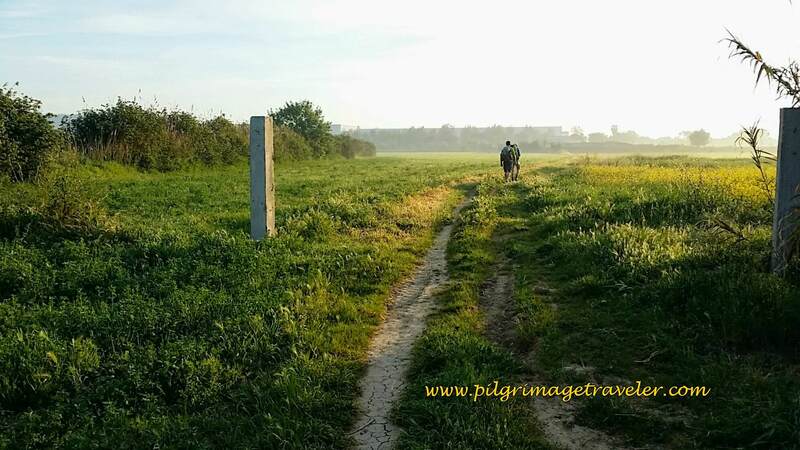 Our Swiss friend was the only pilgrim we had seen on day two of the Camino Portugués until Carregado. After our break, we ran into three middle-aged Americans from New England, walking backwards toward the train station. One of the ladies already had a blister! 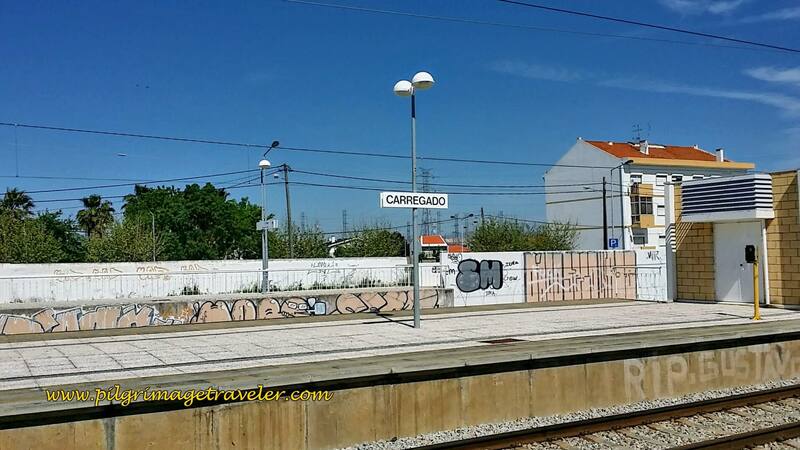 This was only their third day on the Camino and they were going to take the train from Carregado to Azambuja. They were giving up the pilgrimage for the day! It was discouraging to hear, as our spirits were also a bit down at this point. While the walk currently had been hot and boring, I set my resolve to walk, come hell or high water! 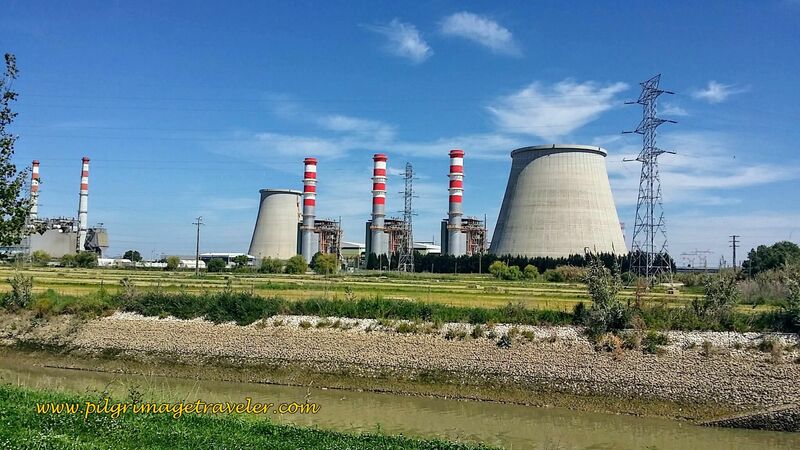 Setting off in the heat of the day, along the Estrada da Vala, the power plant that had been in our view for what seemed like forever, could now be fully seen. Here it is in all its glory! 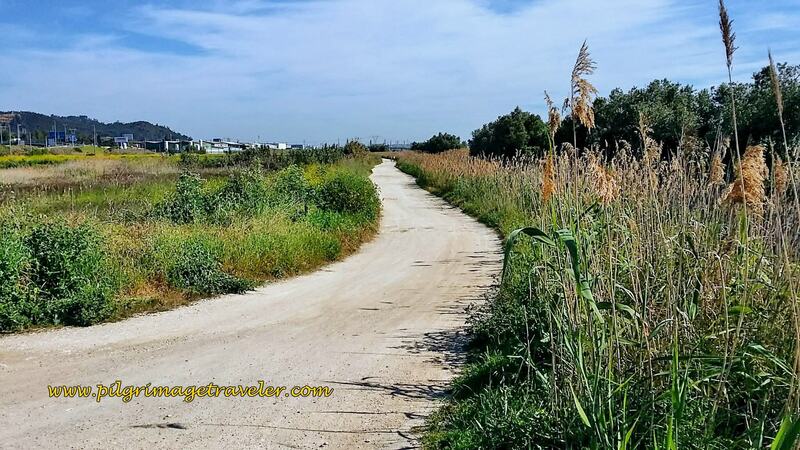 The Camino follows the Estrada da Vala, along a nice walkway that parallels an irrigation ditch, below. 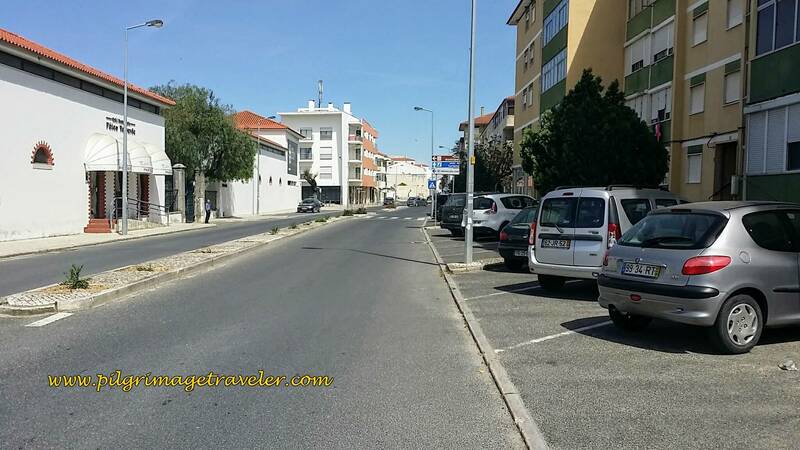 After leaving Carregado, we turned right onto the Estrada da Central, 3.2 long kilometers of open, hot pavement once again! Here I am, smiling through the heat! The Way ahead on the open road looks very long, doesn't it? 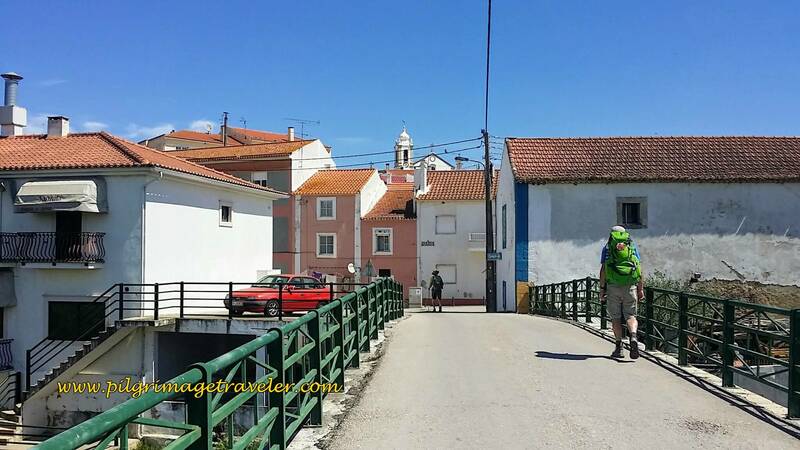 After the long pavement section, we entered into a cute little town of Vila Nova da Rainha. Here is Rich, walking into town. We did not stop here. 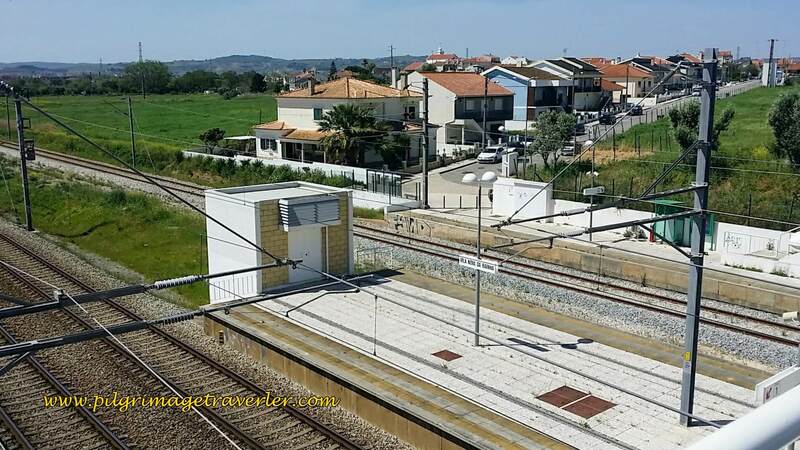 After walking through Vila Nova, it was no surprise when we had to walk up and over the train tracks again. Immediately after crossing the tracks, the way turns left onto yet another long, hot, dry and sandy lane, shown below. The gate seen on the photo is easily skirted on the left. And of course, the sandy lane follows the railroad tracks going toward Azambuja! I voice journaled as I walked behind the boys. It was the time of day when in my tiredness, I always reflected and talked to my journal more frequently. This is the time when more complaints were being registered! Or real thoughts without filters. You be the judge! I felt like I was struggling to stay hydrated. I felt the constant need to drink. I must have been OK because I had to pee frequently as a result! Not convenient! The sun was brutal and I noticed that the back of our Swiss friend's legs were totally sunburnt. I don't suppose his heavy pack carried sunscreen. I offered him some, which he graciously accepted. I was tiring of the railroad tracks. Seemed to me, in these early stages that there was not a lot of pilgrimage history here, and the medieval route of yore was not well-established. 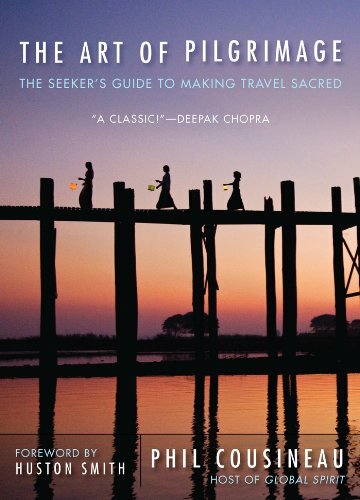 There were no frequent chapels along the way to remind you to say a prayer or express gratitude. I missed this. I reflected that the Portuguese did not seem as friendly as the Spaniards. The greetings along the path today were infrequent. If I engaged first, they were always friendly in return. A little bit of my Spanish/Portuguese did seem to help break the ice. Perhaps describing them as reserved, is more appropriate. I reflected on the loneliness here thus far. Aside from our Swiss friend, we were out here all alone. No real community feeling was part of this Camino yet. In fact we were tiring of our Swiss friend. He stuck to us like glue. So much, that I nicknamed him the Barnacle. In an unholy way, Rich and I continued to call him by this name, when we spoke in private. Sad, but true. After about 3.5 hot kilometers, we arrived at the train station prior to Azambuja, the Espandanal de Azambuja, where once again the Way is up and over the train tracks. I was beginning to dread the stair climbing! Last one for the day! 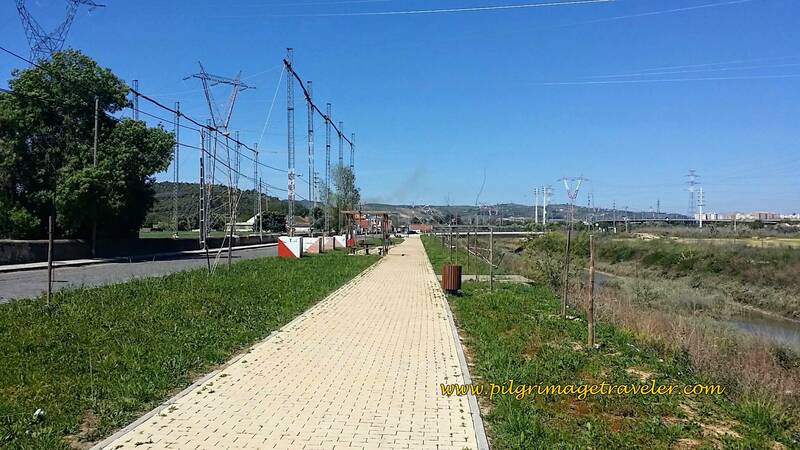 After crossing the tracks for the umpteenth time, the Camino joins the N3 for the final, brutal 2 km walk into town. The entire stretch looked the photo below. Busy road, but with a wide, paved shoulder to walk on. Lots of industry here and lots to look at and distract you. 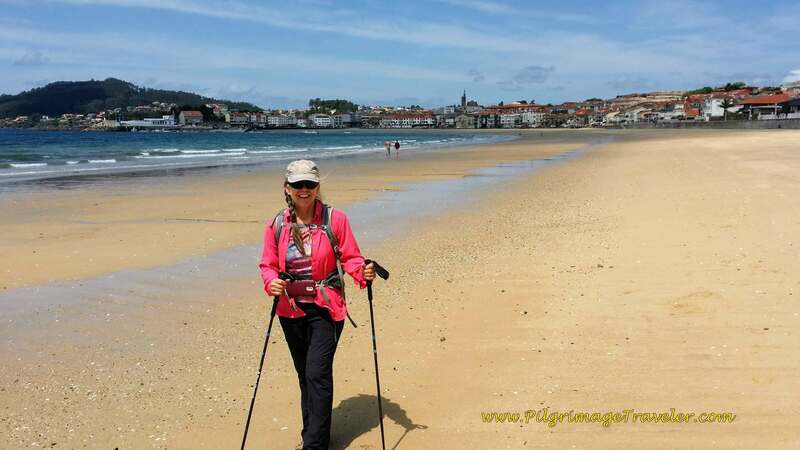 One foot in front of the other on day two on the Camino Portugués. Finally, the town of Azambuja is in sight. 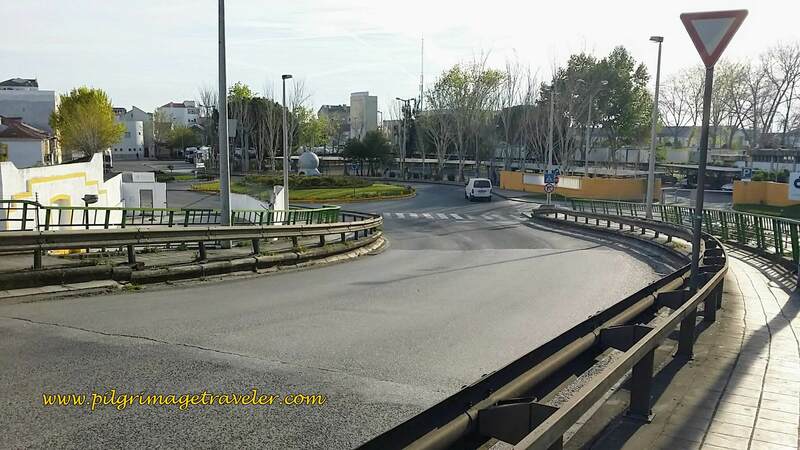 The Camino forks to the left of the N3, and takes you into town on the street below. This is the last photo I took for the day. My one foot in front of the other, had brought me here at last. 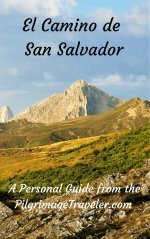 After wandering about looking and asking for the albergue, we gave up, checked our guides and found the Residential Flor da Primavera. 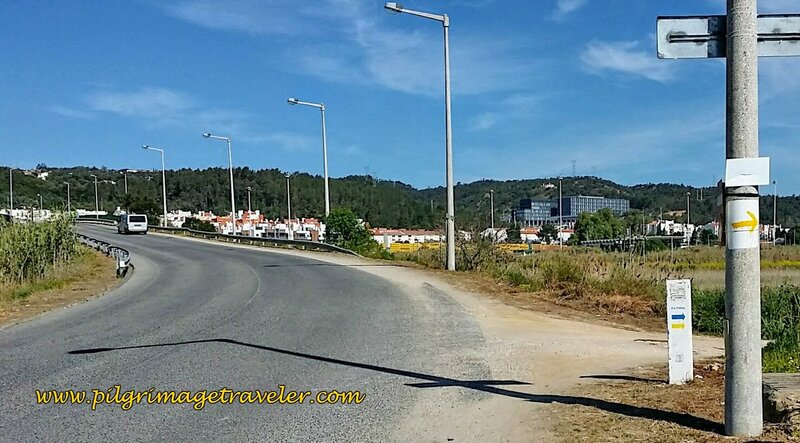 We had passed the Ouro Hotel just before the center of town (see Google map above) but were hoping to find the albergue, and passed on by it. 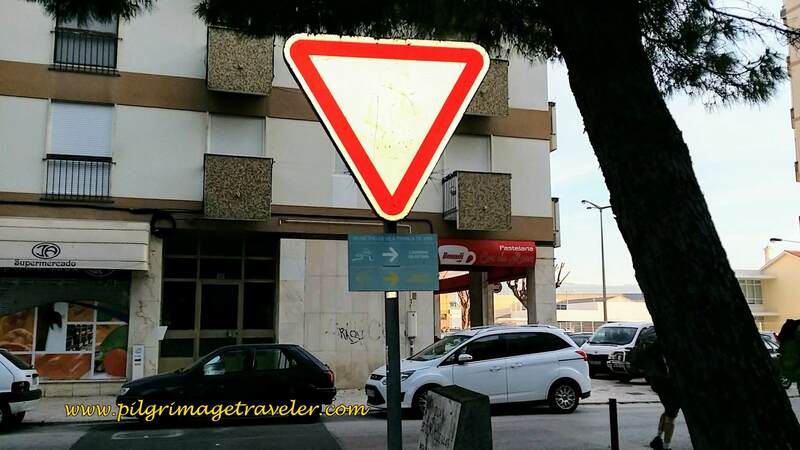 The Flor da Primavera was a comfortable family hotel, clean and with a very friendly proprietress who will hang your hand-washed clothes up on her roof, if you ask her. The cost to us in April, 2017 was 35 Euro for a lovely room with its own bath. I believe our Swiss friend paid 25 Euro for a single. We hoped to go to a grocery store, but alas it was Sunday, and all stores were closed! I needed to replenish my pack with snacks, but it would have to wait until Monday. Our proprietress recommended a café just down the street, called the Café Tatlana (see map) where she said we could get food anytime. Yay! We cleaned up, washed our clothes and went post haste to the café by 4 o'clock. 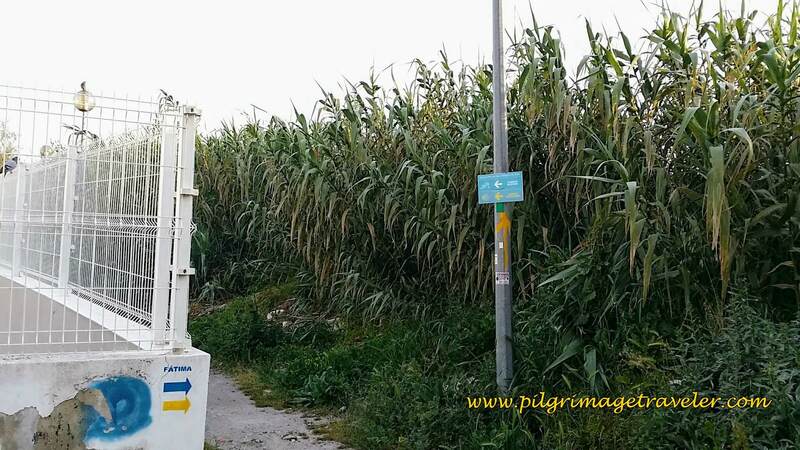 We ran into the three New England pilgrims and were told that tomorrow's leg, at Porto Muge, 15 km down the road was completely booked for a Portuguese event. 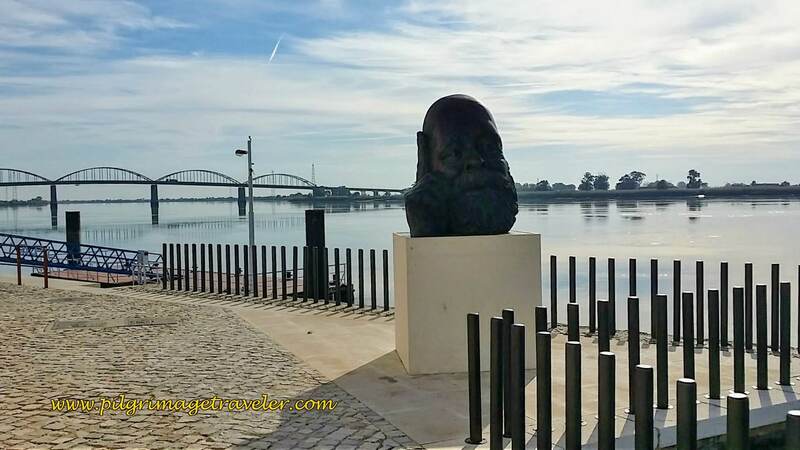 Our only choice was to make it to Santarem at 32 km. Or take a train back and forth as needed. I was worried about our Swiss friend. He looked pretty trashed, and told us he did not want to walk to Santarem tomorrow. We decided that we would see how we felt in the morning. We were served by a very informative English-speaking man whose mother owned the café. I had an amazing stewed goat dish, marinated in red wine for two days. The man introduced us to Aguardente, the Portuguese firewater! He said the name means "fire in the belly" and indeed, that is its very effect. He said it was good for the "recuperation" and yes, of course, it was! My favorite, however, was when he introduced to us, on the house, yet another famous Portuguese aperitif, called Ginja (said like jzhin jzha) a sweet cherry-flavored liquor. I loved it. 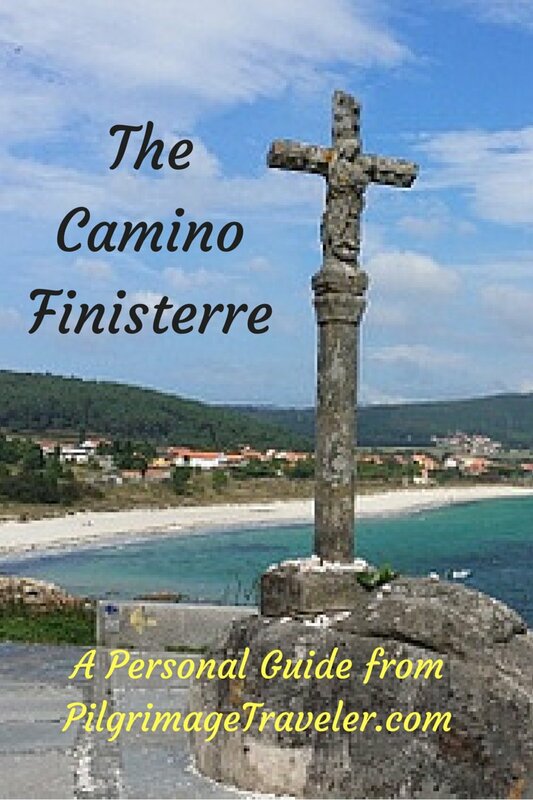 We all ate and drank heartily and sealed our day two's experience on the Camino Portugués. We learned that the café would also open up at 7:00 a.m., just for pilgrims, so we agreed to meet there in the morning. We fell into bed, exhausted, sated and content, at 7:30 p.m.
Persistence is the name of the game for this leg of the Camino. Bring music, or chat with someone, drink lots of water, and take as many breaks as you need. 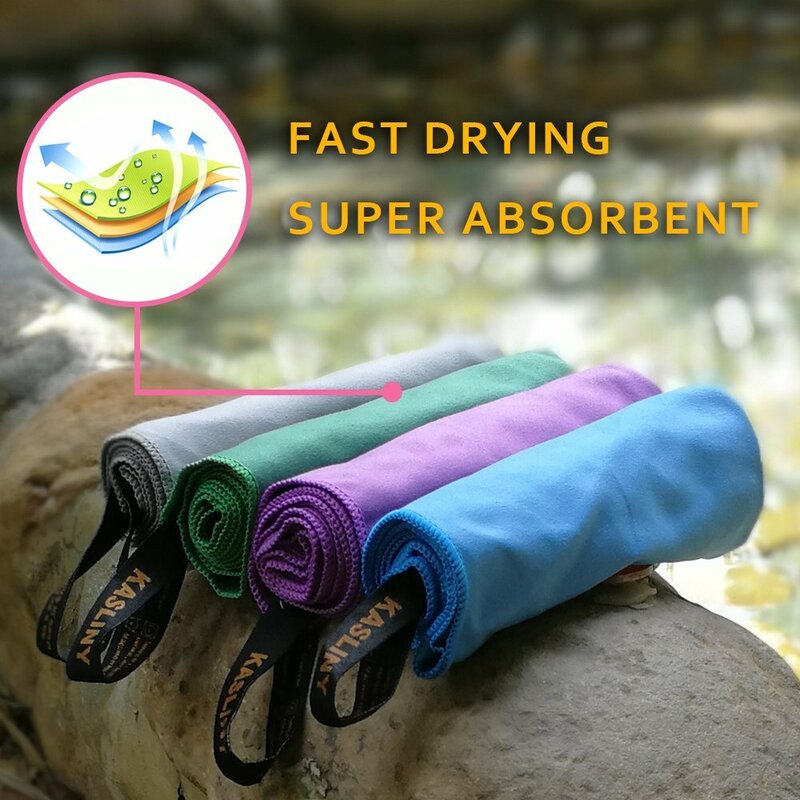 Our rule of thumb is to stop no more than every 10 kilometer, eat something, and air out your feet! Always one foot in front of the other! 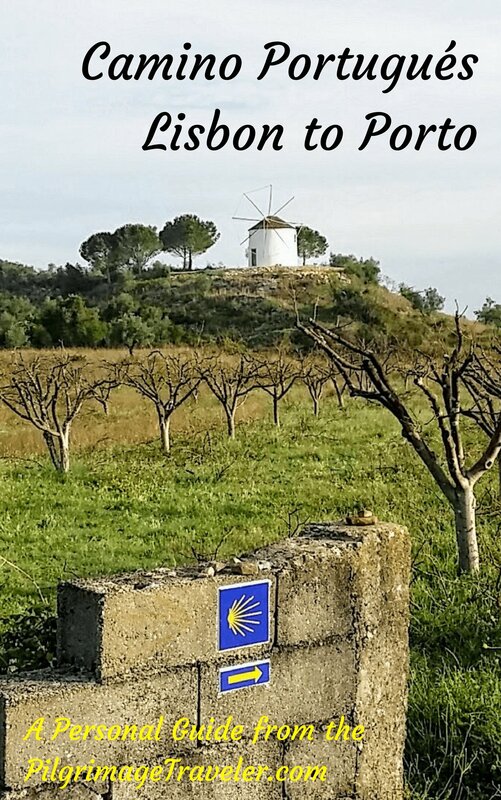 May your own day two on the Camino Portugués be filled with resolution, persistence and hope! May you always continue when the going gets rough, with one foot in front of the other, slowly and surely!